This recipe was taken from Susie Theodorou's new cookbook 'Mediterranean'. 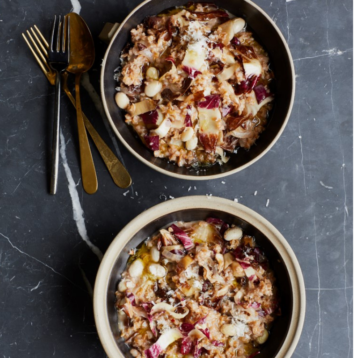 In her book, Susie discusses the versatility of risotto, taking a simple recipe and adapting it to reflect the season you’re in and the produce that’s available. So it felt only fitting to share this creamy autumn-flavoured risotto. Using this recipe as your base, you can then change the grains and ingredients dependant on the season. Place the stock or mushroom water in a deep stockpot and bring to the boil, then reduce the heat and keep on a gentle simmer. Heat half the oil in a saute or risotto pan and cook the garlic cloves until golden, then remove and discard. Add the onion to the pan and cook for 5 minutes until soft, then stir in the spelt, coating each grain with the oil. Add the wine and simmer, stirring, until all of it has evaporated. Add half the stock and the borlotti beans, stir and cook, partially covered, for 10 minutes until the liquid is absorbed. Keep stirring and adding stock for about 25 minutes, until the beans are cooked and the spelt is creamy and tender. Remove the pan from the heat, add the butter and stir to melt. Stir in the cheese and radicchio, cover the pan and leave to stand for 5 minutes. Season well to taste and serve drizzled with the remaining oil.